It's not every day you get a call from the creator of the universe! 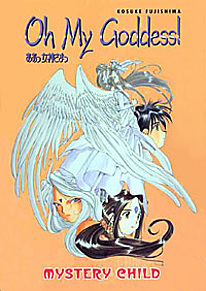 But when the Almighty calls to summon Belldandy's goddess sisters, Urd and Skuld, back home to investigate a problem with the universe's time management program, it can only mean one thing: college boy Keiichi's alone with Belldandy at last! But don't get your hopes up, buddy. Who's this little boy who just appeared out of nowhere in the garden? He's certainly not human, but is he a god, a demon, or something in between? And why is he treating Belldandy like his long lost lover?